Edlund Construction is a full service log home builder and will work with you to custom a log home package to fit your needs, building site and budget. We build both half log and full log construction and can help you through all phases of making your dreamlog home a reality. We work with you throughout the planning stages as well as taking care of the construction of your home with arranging and scheduling the project along with providing start to finish construction labor. We have the same crew on your job from day one until completion. We can also arrange for lot clearing, driveways, culverts if needed, well and septic. With our central Minnesota location it is easy for us to travel just about anywhere to build your home. We have been as far south as Jackson, MN and as far north as International Falls, MN. 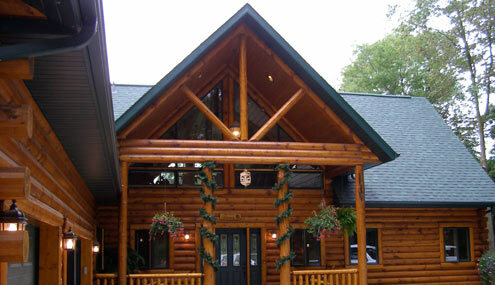 Edlund Construction has also built many log homes in Wisconsin too. As far as Wisconsin goes, we have built plenty of log homes there as well. We have been in St. Croix Falls, Danbury, Winter and Minong areas to name a few. If you wish to apply your own time and efforts to your project we will work with you on that as well. If a log home isn’t your style but you still want the rustic look we can work with you on a hybrid home using materials such as cement board, stone and even some stucco if you prefer. The interior can be a blend of wood and drywall to accent each other. We can still add log accents as trim, posts, porches and on the interior to still maintain a rustic, log inspired feel to the home. A great look can be achieved by mixing these building materials and will make your new home one of a kind. Besides new log home construction we also offer log home repair, restoration, remodeling and additions. 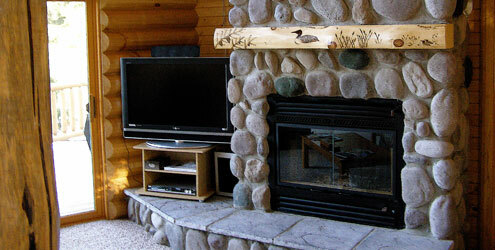 To find out more about those services you can go to our log home restoration or log home remodeling page.